(February 11, 2019) – The brand-new FREECOM+ line is now available from specialty retailers and direct from Cardosystems.com. Thanks to continued customer feedback and extensive development work in the lab and on the road, the new FREECOM+ range is the brand’s most technology-rich Bluetooth offering ever. But what makes them the best-performing Bluetooth communications system in the world and how does the new lineup differ from the preceding FREECOM range? The FREECOM 4+ features a host of specially selected premium features from the revered PACKTALK range, integrated into an affordable Bluetooth system. NEW! 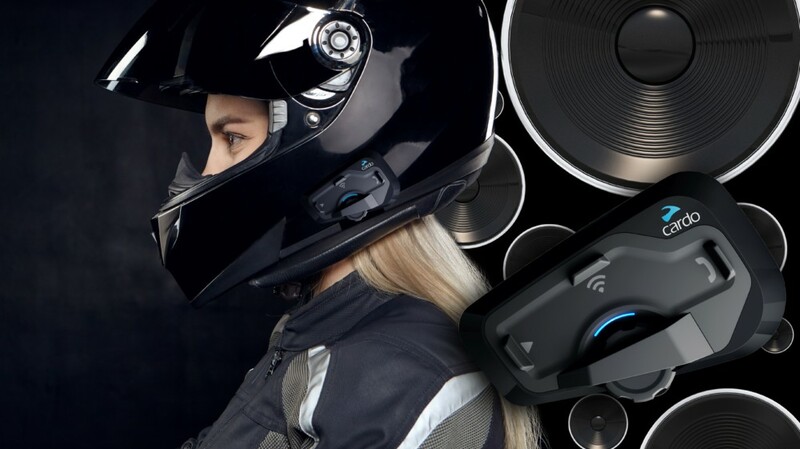 Sound by JBL – the audio system used in the FREECOM4+ is the result of a strategic partnership between Cardo Systems and JBL, the leading audio brand from HARMAN, a relationship that has established a new standard for audio quality for helmet communication systems. NEW! Natural voice-command operation – riders can simply say “Hey Cardo” and the device reacts instantly to follow the given command, without the rider having to press any buttons. The technology seamlessly integrates with Apple’s Siri™ and “OK Google”™ voice-command platforms too. NEW! Ease of use controls, with razor-thin navigation wheel for precise mode and setting selection. Connect one to four riders easily and enjoy a range of up to 1.2km range (0.75 miles). The FREECOM4+ has a Manufacturer’s Suggested Retail Price (MSRP) of $249.95 for single unit – a duo pack is available. NEW! Increased range – the new FREECOM2+ is now two-way rider-to-rider with a 500m range, the previous FREECOM2 was rider-to-passenger only. The FREECOM2+ has a MSRP of $169.95 for a single unit – a duo pack is available. NEW! Unit to unit communication with rider-to-passenger capabilities – the new FREECOM1+ is equipped with rider-to-passenger functionality – a significant upgrade on the entry-level model, but without any change on price! The FREECOM 1+ has a MSRP of $139.95 for a single unit – a duo pack is also available. All units have a battery life of 13 hours but can also be charged while riding. The entire FREECOM+ and PACKTALK ranges can be controlled using Cardo’s new mobile app, Cardo Connect™. Free to download, the app has been designed for a smooth user experience and shows a dashboard of information associated with the connected Cardo device. Users can create ‘groups’ of riders, manage their favorite radio stations, configure phone speed dials, control settings, adjust volumes and see the units battery status at a glance. Like the complete Cardo range, the whole FREECOM+ lineup is IP-67 waterproof – not simply water-resistant – so riders can be sure that no matter what the weather, they can rely on their Cardo unit. All feature a two-year warranty and a local customer-support via Cardo’s local distributor.